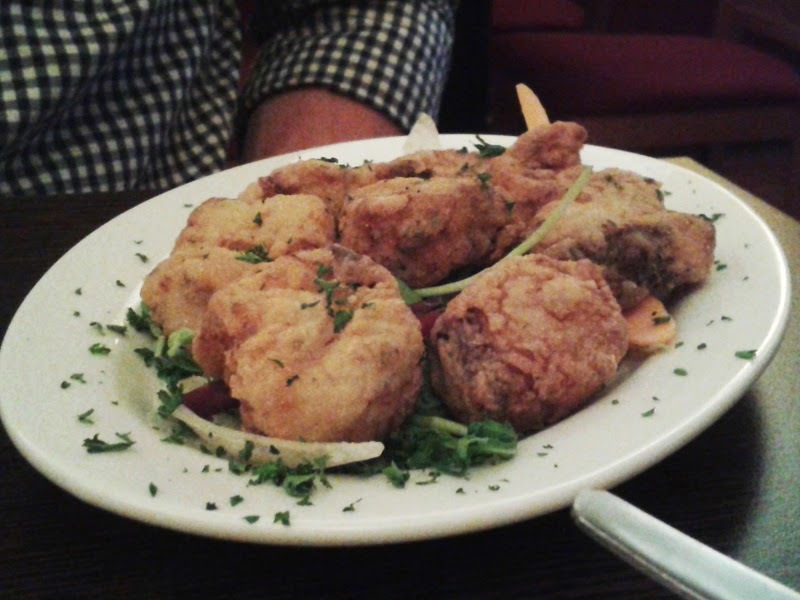 Good Spanish food in the city is almost as hard to come by as Italian cooking even though two of the most popular restaurants are exactly those. When you walk past they are heaving to the rafters with parties and hen dos lining their stomachs on set meal menus. But if you like it authentic then it's all a bit sad face. So when fellow blogger Rosie wrote a glowing review of Agua Dulce, a place I've been hearing very good feedback from in general, I knew I had to pay a visit. Located in a slightly grotty street just off the seafront, the grey and grubbiness subsides as you pass through the doors and are transported into the sunny interior. The welcome was slightly less sunny and turns out the charm is only showered on the "pretty girl" tables. Myself and Mr GF clearly were not the waiter's type! We were also gruffly told that we'd only be allowed to put an order in once to the kitchen as they were busy, which looking at the half empty room and trying to get my head around what I believed the casual concept of tapas was, peeved me off slightly. Not the greatest start. Still, I was generally in a rare good mood so didn't walk out but ordered two dishes initially, stubbornly retaining the menu with a solid grasp my best firm "business" smile. Luckily the food arrived and we soon forgot about the bad start. The fish here is very, very good. I have never eaten octopus that didn't remind me of car tyres, but here was cooked by someone who must be very experienced with seafood. Being thinly sliced helped the off-putting texture of the suckers and made it far more enjoyable. Usually Mr. GF has to polish off the seafood plates but I ate my half of this quite happily. I also like that it had been placed on sliced potatoes for substance and generously sprinkled with paprika. 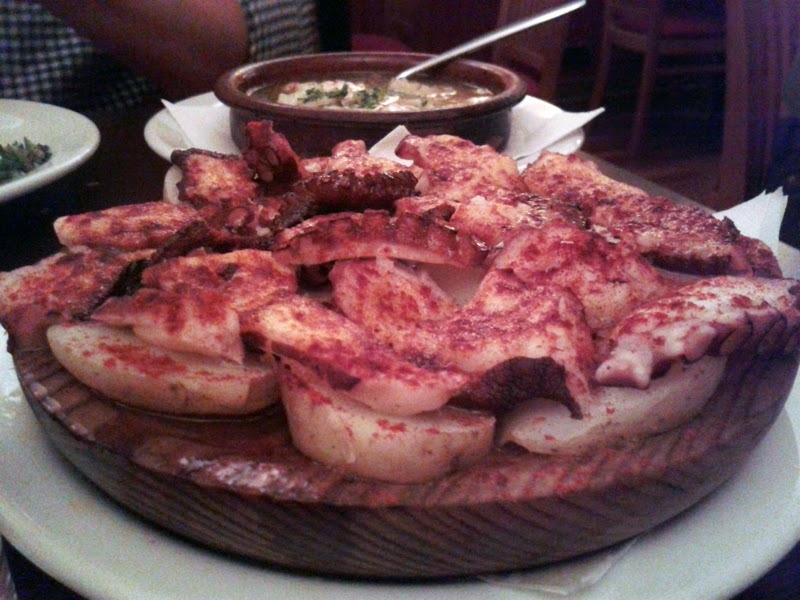 Although it was one of the more expensive small plate dishes, was larger and good value at £8.95. Small pieces of marinated shark steak were floured and fried, giving you that crisp exterior whilst locking in the sweet, tender fish on the inside. Delicious. 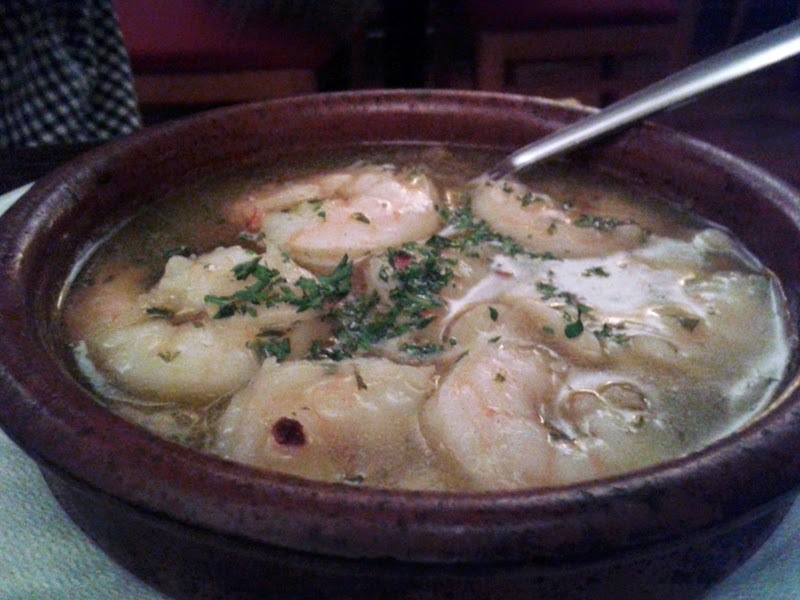 Gambas Pil Pil is a classic, simple dish and what not to like about a sauce of wine, lemon and chilli? 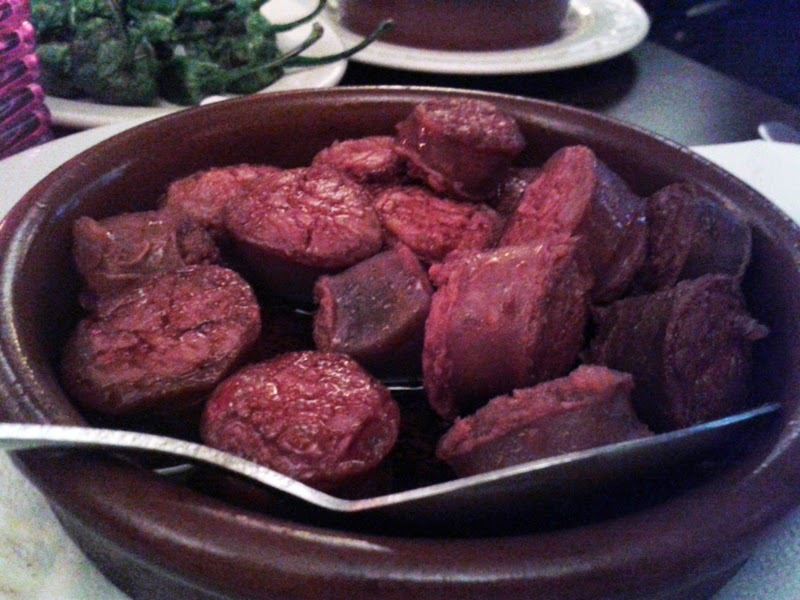 Chorizo is a must and although not as interesting as some of the other dishes, essential for mopping up that incredible oil with bread. I normally like it cooked in sherry but this was just pan fried, but still really nice. 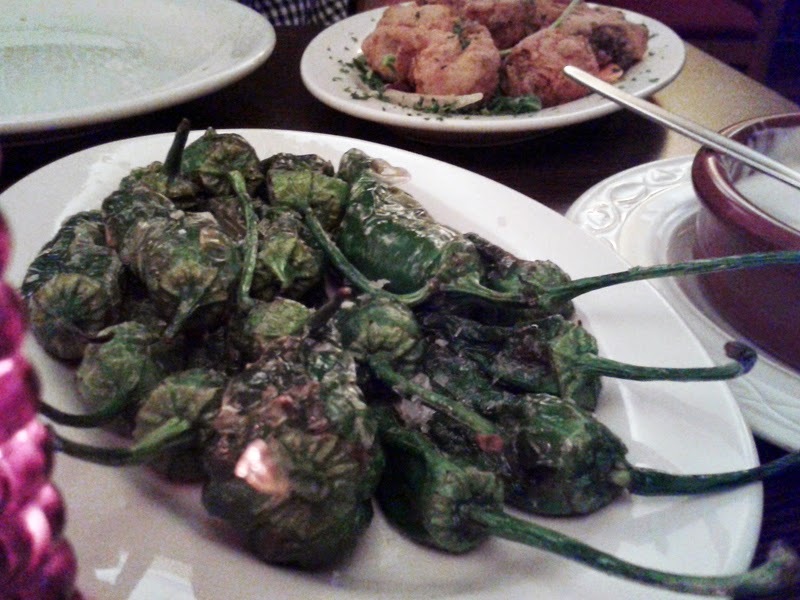 And finally...Padron peppers are an absolute must, aren't they? On the subject of bread, I was amazed, even though I'd seen it on Rosie's blog, at how rubbish the bread was. Cheap, gloopy supermarket "French Stick". (Won't insult the French by calling it a baguette even.) It could be a lot better, especially with the increasing amount of the great bakeries in town. I almost felt sorry for the decent aioli served with it. We didn't really bother with the dessert menu which had the usual flans and things. Moving on for dessert after a meal is my new thing this summer. I would be very keen to go back for the main meals, especially the fish, possibly even a paella. The one on the table next to us looked a treat. Some of the more unusual tapas specials were quite enticing too. So what they lack in desirability of location, they do make up for with fresh, good quality and reasonably priced food. I think our bill came to abut £60 which included service (ho-ho) and a £28 bottle of wine. If you fancy that taste of Spain then I think this it the closest you are going to get to it. Just make sure you go with a group of your prettiest girlfriends and leave the bearded dude at home in front of the telly.